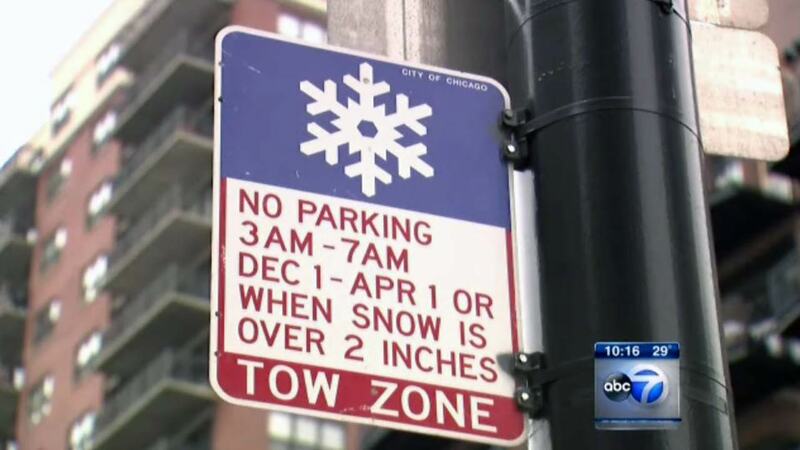 CHICAGO (WLS) -- Chicago drivers should watch where they park their cars for the night Monday, or else they may wake up to find their vehicle towed. The city's winter parking ban takes effect at 3 a.m. Tuesday. The ban will be enforced nightly from 3-7 a.m. from Dec. 1, 2015, to April 1, 2016, whether it snows or not. It impacts more than 100 miles of arterial streets throughout the city. Look for parking signs with a snowflake on a blue background, like these. In addition to the overnight parking ban, drivers should not park in those areas at any time if the snow on the ground is more than 2 inches deep. Anyone who does not follow the signs will be ticketed and their cars will be towed. Here's a map of the streets included in Chicago's winter overnight parking ban. Here's a list of the overnight parking ban routes. For more information, call 311 or visit www.cityofchicago.org.